DiDeA, the studio of architects Nicola Giuseppe Andò, Emanuela di Gaetano, Alfonso Riccio and Giuseppe De Lisi, has converted an old antiques shop in central Palermo into a street food restaurant. The interior design preserves the original early twentieth-century floor with its art nouveau motifs and creates contrasts with simple furnishings in industrial style made out of materials such as steel, wood and iron. The long, narrow shop was originally made up of a number of adjacent rooms which the architects transformed into a single space dominated by hues of grey. 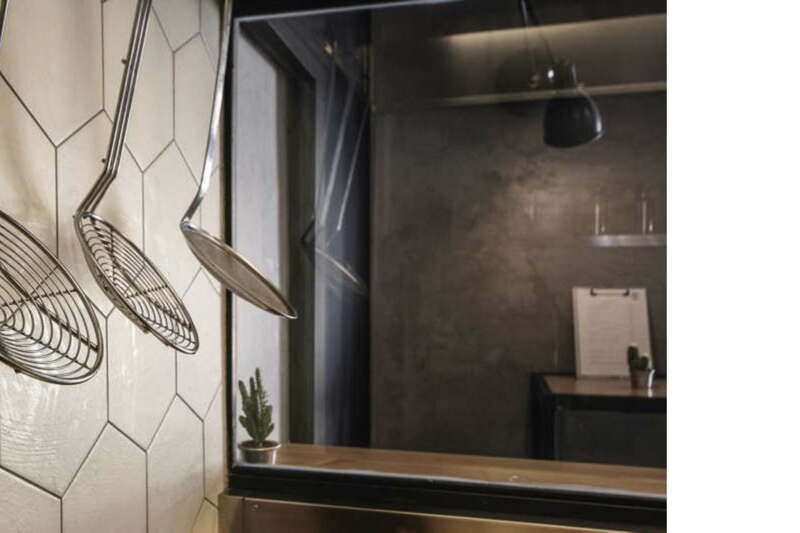 In the middle, a big exposed concrete and timber bar counter runs right across the restaurant, with a perforated black sheet metal volume above it serving as a little storage area containing adjustable light fixtures. The entrance is a big glass and iron door which can be opened up completely to establish continuity between inside and outside, in line with the nature of a restaurant serving “street food”.